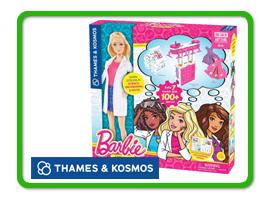 Barbie-This project kit includes a Barbie or Nikki doll, plastic building pieces, and science experiment materials to create seven models. Each model is built to “Barbie-scale” and is compatible with the original Barbie Dreamhouse. Geckobot – Build a wall-climbing robot! A motorized air suction system enables Geckobot to walk vertically up and down smooth surfaces. 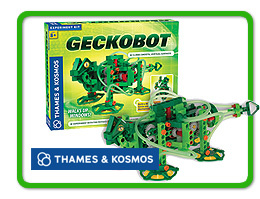 The battery-powered motor drives an innovative gear system that makes the legs move like a real gecko. Mighty Makers – Help Lily make her own movie! Build the stage where the video takes place. Learn various filming techniques, and once filming has ended, rebuild the stage into a theater to watch the final cut.